NEW YORK, New York — With a jubilant opening ceremony held on July 4, the Armenia Fund unveiled the newly built community center of Aknaghbyur, a village in Armenia’s Tavush Region. The construction of the two-story building, which was close to $163,000 to finance, was sponsored by the Fund’s French affiliate through the financial support of French-Armenian benefactor George Tavitian. A Donor member of the Fund, the Tavitian family continues to make major contributions through fundraising events organized by the French affiliate. The roster of officials and supporters attending the community center’s opening ceremony included Hayastan All-Armenian Fund Executive Director Ara Vardanyan, Tavush Deputy Governor Vahe Vardapetyan, Aknaghbyur Mayor Karen Dolmazyan, Mr. and Mrs. George Tavitian, and a delegation of some 50 benefactors from France. The guests were welcomed with the waving of the French and Armenian flags and the traditional offering of bread and salt, the atmosphere filled with the festive sights and sounds of folk music, singing, and dancing. Aknaghbyur’s new community center will house the mayor’s office, a public library, an events hall that can accommodate up to 50 people, and a medical clinic with a separate entrance. The multifaceted structure is of great significance to the ongoing development of the village. For many years prior to the realization of the community center, the mayor’s office operated out of a tumbledown building, which to this day provides shelter to two refugee families; the village lacked a space where it could hold community events; the public library was located in a damp, half-built structure; and the medical clinic was housed in a metal hut. “Two months ago, during the opening ceremony of Aknaghbyur’s new drinking-water pipeline, I promised the villagers that they would soon have yet another reason to throw a big party and here we are celebrating the opening of the community center, which is of such great importance to every resident,” said Ara Vardanyan in his address. Also delivering remarks were the deputy governor, the mayor, and community members. The Aknaghbyur community center is one of many examples of the comprehensive infrastructure and community development projects implemented by the Armenia Fund across rural Armenia and Artsakh. Within the past three years, the Fund has addressed a number of key issues in Aknaghbyur, with support from Armenian donors worldwide. Initiatives completed to date include a natural-gas network (through the sponsorship of the Holy See of Etchmiadzin), an irrigation pipeline (through the sponsorship of Armenia Fund USA, the Fund’s U.S. Eastern Region), and the reconstruction of the potable-water pipeline (through the sponsorship of the A.R.F. Central Committee of Canada). In addition to such extensive infrastructure improvements, the Fund has brought to fruition a host of educational, farming-assistance, and social aid projects in Aknaghbyur. These include the renovation of the community school’s sports grounds (through the sponsorship of Cypriot Parliament member Vartkes Mahdessian); the establishment of a computer lab at the school (through the sponsorship of Laurent Paulhac of New York); the provision of agricultural equipment, seedlings, fertilizers, and other necessities to farmers; and the provision of social aid to several economically vulnerable families. Home to approximately 500 residents, Aknaghbyur is one of Armenia’s oldest continually inhabited communities. It was founded in 451 A.D., in honor of General Vardan Mamikonyan. 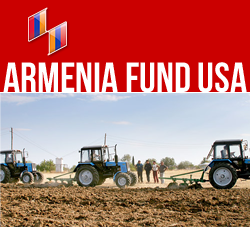 Aknaghbyur is among 12 Tavush villages receiving support within the framework of the Armenia Fund’s Rural Development Program.